This chair is not painted as you might at first think. It is made entirely of recycled plastic bottles that once contained shampoo, washing-up liquid or suntan lotion. The bottles were collected in community collection points, cleaned and chipped. The board was made by pressing and heating the plastic chips so they bonded together, and you can still see the different colours of the bottles and even fragments of printing on the chair. Jane Atfield had seen board like this made by the firm of Yemm & Hart of Missouri. 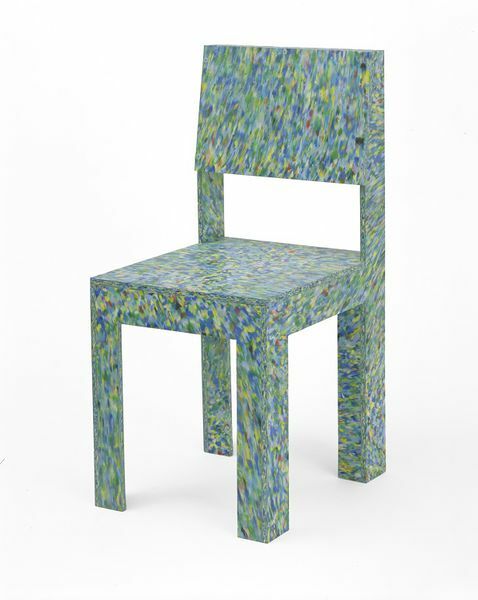 At first she imported their board, but this chair is made of recycled plastic panels Atfield made in Britain. The shape and form of the chair are simplified and its structure relies on the strength of the panels which are simply screwed together. The shape owes much to chairs designed by the Dutch designer Gerrit Rietveld in the 1920s and 1930s. Atfield's chair advertises the fact that it is made of recycled materials and, in the mid-1990s, it became emblematic of the environmentally friendly design movement. Chair made of multi-coloured rectangular panels cut from recycled plastic board, screwed together with visible, countersunk metal screws. The two sides are made of identical h (lower case)-shaped panels, with two inverted u-shaped panels set between them at the front and at the back, to the front of the back uprights. The seat is a single panel notched to fit round the back uprights. The short back panel is applied to the front of tapered upper sections of the uprights and a narrow panel joint the top of the uprights behind this. The RCP2 chair is most widely known as 'Atfield chair'. Its design followed an earlier Rietveld-esque chair designed by Atfield as an homage and provocation to her tutor, Eric de Graaf, and was included in her graduations show at the RCA (MA in furniture design). The latter chair was made of recycled plastic board which she imported from the American firm, Yemm and Hart of Missouri. The chair has been sold by 'Made of Waste' around 1997/8. Atfield has made 80 to 100 at the most, including the smaller child's version. The largest order was for 30 chairs for Live TV at Canary Wharf. Beams Ltd. bought about 50 pieces of furniture, including RCP2 chairs, tables and storage towers. (All numbers from interview with Gareth Williams, 28 February 1996). Atfield discovered high density polyethylene board when in her final term at the RCA: a colleague brought back a sample of recycled plastic board made and sold by Yemm and Hart from a trade fair in New York. (Yemm and Hart was a company specialised in contract seating but had branched into the manufacture of recycled plastic.) In contrast to plastic board which is identical in appearance but based on industrial off-cuts of virgin plastic, Atfield defines 'recycled' board as made of post-consumer plastic, ie plastic that had been sold and used. The non-recycled board is stronger and more flexible than recycled board, qualities that affect the form of Atfield designs which tend to be based on rectangles rather than curves. According to Atfield, the material lends itself to simple forms as it is visually very busy. In an interview with Gareth Williams (28 February 1996) she admits that the chair is not a radical but more an obvious design, a vehicle for the material and a message of recycling. The aesthetic of simplicity of form seems to be in keeping with the ethic of recycling. Atfield started experimenting with the material importing her own supply of materials from America. The chairs and tables were received with interest and Atfield was commissioned to design the furniture in a student bar at the University of Westminster. This attention led her to set up the company 'Made of Waste' in partnership with the chair of the recycling council, Colin Williamson in January 1995. The main motivation for the company was, that shipping the material such distances was not environmentally friendly. The price, £66 per board is set by the makers in Kew who were the only people at the time who made it. The price was twice the price of MDF. Plastic boards from Made of Waste were bought by companies like EDAY in Japan as well as Neotu in Paris. Atfield experimented in 1998 with adhesives to bond the boards together which has not just implication for the design but also for potential consumers as environmentally conscious people tend to reject the use of synthetic adhesives. 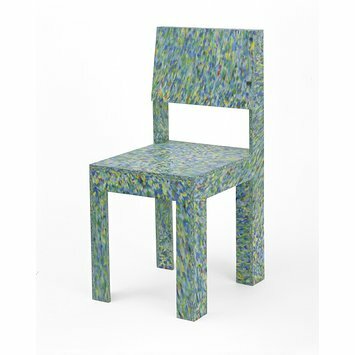 The simplicity of this chair's form draws attention to the material from which it is made; compressed chips of plastic bottles from community retrieval schemes. Atfield's conspicuous use of recycled materials made this an icon of the 'green' movement in contemporary British design. Appropriation of components and experimentation with materials has informed much of her furniture design. Recycled high-density polyethylene board is made from used plastic bottles, chipped and heat-bonded. Initially, Jane Atfield imported the boards from America, but later she had them made in Britain, which reduced the environmental transport costs.